Did you ever wonder what goes on in your garden when your back is turned? Do you suspect there is a secret life out there that you don’t quite know about or understand? I’ve written before about the mythical life of garden fairies and sprites. I suspect that at the end of the day in the twilight, just as the last bit of light from the day disappears, they begin to stir and prepare for a night of general mischief and fun. I try to provide a few plants I think the garden fairies will like, such as fairy lilies, so they’ll come and stay a bit. And I blame them when I lose things, like a pair of gardening gloves, out in the garden. Finally, there is the secret natural life of the garden, a world that I know some about but would like to learn a lot more about because I think it will make me a better gardener. The natural life includes everything from microscopic organisms eating through plant material to make rich compost up through earthworms, insects, and the relatively gigantic birds and bunnies. If I understood it better, I might be able to keep the darn rabbits from eating my beans! And why the picture of the mushroom? 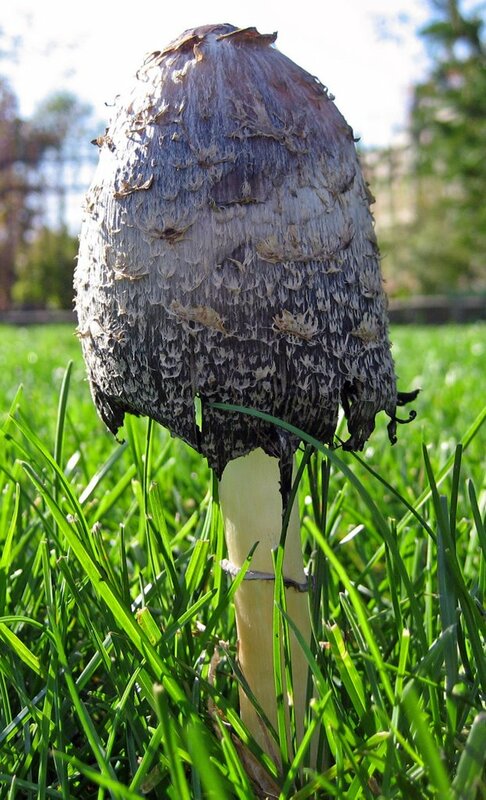 It just appeared in my yard out of nowhere as most mushrooms do, but instead of mowing it down, I mowed around it. I thought it was a good halfway point, a wee bit of shelter, should a garden fairy attempt to cross the great expanse of lawn in my back yard. I really enjoyed reading this post! I am sure the fairies delight in knowing that you respect their shelter which I must say looks like the ~~magical fairy lily!~~..in allowing it to continue growing on your lawn. I wonder if they place them there purposely to test who believes in fairies!! I said that mushrooms appearing in the garden is magic.How they spring up, like a big top tent with the circus.Just blow in and pitch up.The garden is full of light, life, and magic.I have gnomes, frogs etc.Representations of the spirits that live in natural places. I have one of those fairy lilies in my front yard, a red one. Do you think I need to put one in the back too? Hi Carol, thanks for stopping by. I am from Indiana, but up near Lake Michigan. I was a Master Gardener there so we had real dirt and real rain. In the desert, our soil has .3% organic matter compared to 4-5% in other areas. So our plant palette is limited. I took a botany class called Plants of the Southwest Deserts after I came here. It takes a while to get use to the aesthetic here but you come to admire these hardy plants that survive in this desert environment. It certainly is a challenge to have a beautiful yard. You learn to admire and appreciate a more natural look. People who try to make their yard look like Virgina or Oregon are in for a big surprise here. I do envy your ability to grow wonderful flowers and vegetables, I miss that. I'll stop by again. Love Beatrix Potter books...they`re making a movie about her life. I used to read Mrs. Tiggy-winkle to my daughter as well. One of the best parts about gardening is discovering the little trail of secrets the garden fairies and sprites leave behind. My Scottish grandmother believed in fairies and sprites and passed on to me their importance. 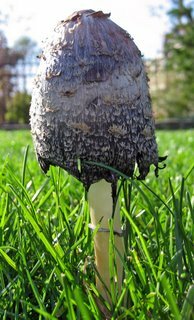 Whenever I find a mushroom in the garden, I swear I see a little fairy peeking out around it...very polite to mow around the mushroom! What a wonderful post... I now find myself wishing that there were a whole series of books like "The Secret Life of Bees" to explain some of the natural mysteries in the garden.